The world continues to change at an increasingly rapid rate, students need to learn In both academic and practical/social context so they can develop new skills and knowledge as required to think critically; find, choose and interpret information; solve problems; withhold judgments; understand issues from various views; communicate clearly and appropriately; make informed; reasoned decisions; manage their own time and so on. Therefore, such steps are initiated to make it possible for students and in the article below I am going to elaborate what is students helping students (SHS). Every school or academy can operate the program ‘students helping students’ (SHS) to provide a rich environment to reach to the specific purposes; To help students become engaged confidence, independent and versatile people who are ready and excited to take new challenges, peer collaboration plays a crucial role in developing many of the skills needed; it also provides a great array of relevant experiences by emanating all participants learning from each other not just the ‘helpees’ gaining from the helpers. 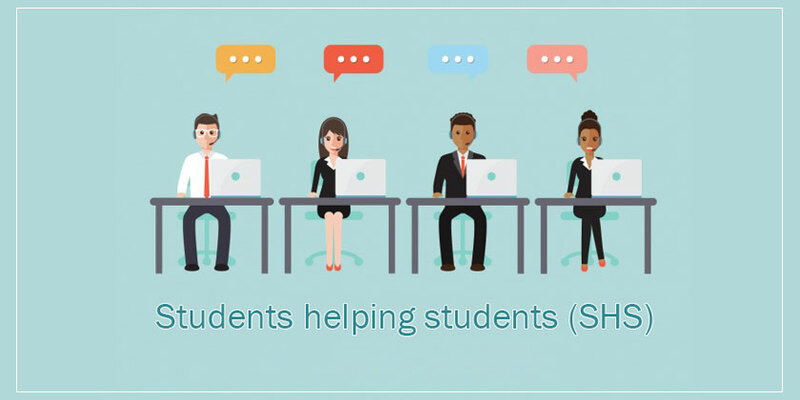 In particular, most students are comfortable interacting with peers than with academics/professionals, so students who might not seek otherwise seek help have a viable option with peer support. Enhancing the academy experience by facilitating students in academic & administrative issues & initiating programs to improve student’s satisfaction resulting not only in an enriching student’s campus experience but also to make them capable of performing at higher intellectual levels when asked to work in collaborative situations. Students will be the target of this program. Dealing with students & their family issues and connect & guide them to the specific office where their problems can be solved. Professionals taking pride in being responsive and sharing similar experiences as well as discourse, so the exchanges are relevant to the student who is seeking support. To bring together all the other programs, activities, opportunities where students help other students to increase peer engagement. To address some of the key issues students face on placement. In addition, develop ongoing support, professional learning, collaboration and reflection. Sharing of ideas and resources. Ability to recognise connections with people from different backgrounds and with different perspectives. To focus ever more on areas such as understanding, analysing, evaluating and problem-solving rather than on ‘knowing’ facts. To share similar experiences. This not only allows for greater understanding; it also results in a more ‘efficient” support session. To sustain the learners through transitions to less optimal learning environments. Create and maintain a filing system; locating documents for student’s issues; and filing documents in their corresponding location. Responsible for responding to general emails, calls, forwarding emails to concerned departments/offices & registrar office. Serve as primary contact between the university & students or other stakeholders. Calls to the fellow intern in main offices i.e. academics, examination, finance & administration for helping in the issues of students who approaches the centre. Be in contact with volunteer students/Fix-it Member and listened to their day to day cases and maintain their progress reports. Responsible for collecting the issues of the students & forwarding to the Fix-it centre. Would be wearing their badges of Fix-it centre. Responsible for guiding guests, visitors and students towards those offices for which they are looking. Although their focus is on peer learning, the optimal peer support methodologies and principles pertain to any peer support program. In brief, a shared domain of knowledge legitimises the community of practice by clearly defining boundaries what is and is not included- and affirming its purpose and value. A community requires interaction and collaboration among members and promotes respect and trust so members can freely share idea, knowledge and uncertainty. The practice is the set of ideas, frameworks, tools, information, styles, language, stories and documents that the community members share, in other words, the practice is what the community develops.